When looking at the Martin Mac 700 profile you might find it hard to fully comprehend just how Martin has placed so many features and so much power into a sleek moving head this compact and light. But a compact, light, fixture with power and optical precision beyond its peers is exactly what Martin set out to achieve in the Martin Mac 700 profile. Fully equipped with all the industry standard Martin features, the Martin Mac 700 profile also combines a full CMY color mixing system supplemented with an 8 position color wheel and a gobo animation system for dramatic projection effects. • Strobe effects up to 10 Hz. A 700 Watt, double-ended lamp works together with a tremendously efficient reflector to punch out more light than you are used to seeing in a fixture this compact. 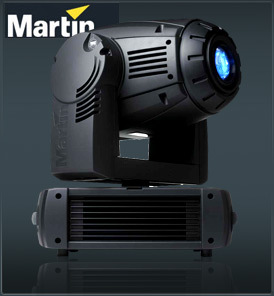 A variable motorized zoom allows for full control over the beam angle of the Martin Mac 700 profile. Without restrictions or lens changes the fixture zooms continuously from 15 to 31 degrees. A variable focus system allows you to adjust the sharpness of your projection at any beam angle, whether you need a razor sharp image or a de-focused background effect. A fully DMX - controlled gobo animation system - unique to a mid-sized luminaire, is specially engineered to create spectacular animated effects such as flowing water, flames or stormy skies. The system comes complete with one animation wheel, with further wheels available to expand your library. Each wheel is quickly changed via a magnetic coupling without the use of tools. Glass, textured glass or metal gobos fit within a six-position rotating and indexing gobo wheel, (plus open) and nine metal gobos make up a second static gobo wheel, (plus open). The combination of two gobo wheels easily allows for advanced morphing effects adding a huge range of graphical possibilities. The gobo system permits 16-bit control for extreme accuracy with all gobos easily interchangeable, removing any obstacle to your creativity. A full range dimmer/shutter is very accurate and allows for both smooth and fast intensity changes, whether it is a long fade, or a snap to blackout. In working combination as a shutter, accelerated strobe effects are possible up to 10 Hz. As well as the CMY color mixing system the MAC 700 Profile features a separate color wheel with eight slots plus open. Color selections may be changed quickly and easily, offering a seemingly limitless array of color combinations. A bi-directional, 3-facet prism rotates at variable speeds, adding unique effects to gobo projection. The prism can also be replaced giving lighting professionals further options for customization. A motorized iris allows you to resize the beam quickly and accurately for fast effects with smaller beam sizes. The PFC Electronic ballast provides the Martin Mac 700 profile with a flicker free image making it ideal for television and film work. It also allows hot lamp re-strikes and for the fixture to run in a reduced power mode; extending lamp life and further reducing its low noise output. An auto-sensing power supply covers worldwide voltages and frequencies allowing the fixture to operate anywhere in the world. The Martin Mac 700 profile contains head and base temperature sensors to ensure that fan speeds are kept to a minimum; bringing noise levels right down to suit theatre and TV studio applications. 540 degree pan and 246 degree tilt are achieved through Martin¹s outstanding pan and tilt motors which give faster-than-ever movement for a fixture of this size with noticeably less noise than other fixtures on the market. An intelligent positioning correction system automatically returns the MAC 700 Profile to its original position should it accidentally be knocked out of place while a multi position, tilt lock mechanism is also featured to permit easy maintenance and handling. An exceptionally functional modular design allows you fast and easy, tool-free access to critical components of the fixture. This reduces maintenance periods, saving time and money, and ensures that fixtures spend as much of their life as possible performing. The Martin flight case, designed for the MAC family, is recognized in the industry as one of the best purpose-built cases for the transportation of lighting fixtures. Made of durable ply, it is covered in a tough water-repellent coating for added protection. An ingenious, patented universal adapter allows axle friendly clamping that preserves the surface and shape of the fixtures hardware like no other can. A direct development from our hands-on approach, this is a device which whilst small, can save many hours in maintenance time and has been specified by the needs of the market. The Martin Mac 700 profile is DMX512-controllable, equipped with both 3-pin and 5-pin XLR in/out sockets, and totally compatible with coming future standards such as ACN or Ethernet-based protocol.